We have a couple of different options for getting started with your tournament. The first is to use our quick and easy printable versions, you can start by printing the appropriate schedule needed for the tournament by clicking here. If you don't know the exact number of teams just estimate and print all of the brackets within a certain range. 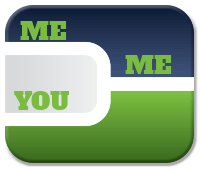 The second option is to use our Round Robin Generator to create your entire schedule, by entering team names, locations, and even dates and times. The Round Robin tournament is best when you have a small number of teams and/or a long time frame. To help with your planning we have created a cool little tool that will calculate the total Number of Games in Round Robin Tournaments. This will let you know the total number of games that will be played, and help you determine if your tournament should be broken up into different pools. Round Robin tournaments can be used for league schedules or tournaments that guarantee a certain number of games. The schedules on this site allow each team to play every other team one time. If you have a lot of teams you can break them up into divisions. Be sure to decide the tie-breaker before the tournament begins. Usually the tie-breaker will be which won the head to head match. 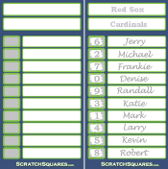 Now you will need to draw to decide which team will be assigned each team number. You will place each team's name in a hat and begin drawing the teams one at a time, the first team's name drawn will be assigned "Team 1", the second team's name drawn above will be assigned"Team 2" and so on. This can be viewed in the illustration below. The tournament is ready to begin. Start at round 1 and play all of the games for that round, then move onto round two. Continue this until all of the games are played. This can be viewed in the illustration below. 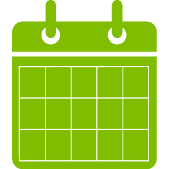 We have included spaces on the schedule to track each team's win/loss record. The team with the best record after all games have been completed is the winner of the tournament. 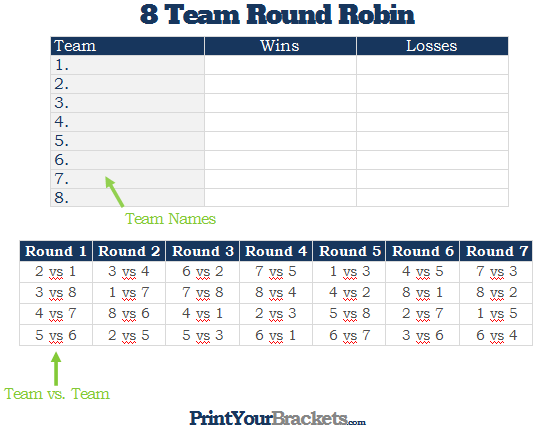 Another popular option is to use the records from the round robin play to seed a single or double elimination bracket.